The Burgundian countryside is filled with little farming hamlets. A little outside of the village Vignol, between Vézelay (17km) and Corbigny (12km), you'll find one of these tiny places. Your vacation home (with indoor swimming pool!) and superbly maintained garden lie at the edge of the Morvan, a hilly, natural area with deep forests, small streams, and lovely lakes. You'll do your grocery shopping in Monceaux (4 km). Here you'll find a supermarket, restaurant, and tennis court. 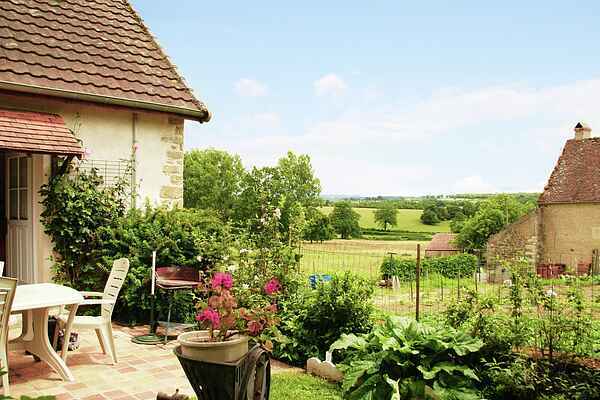 In Burgundy, the cultural richness of the region matches that of the beauty of its landscape. Vézelay, an intersection of Roman and Gothic art, has long been known for its superior wines. The ancient towns of Avallon (29km) and Clamecy (21km) are also worth a visit. The same goes for the quartet of castles around Corbigny. Chitry-les-Mines, Villemolin, Lantilly, and Marcilly will compete for your attention. For something a little more modern, head to the automobile museum in Sauvigny-le-Bois (31km) or do some rock climbing at St. Père (16km). Water lovers will be happy as clams in Lormes (17 km). At the lakes of La Collancelle (22km) and the large reservoir at Brassy (27km), you can rent canoes and small boats.